When a security alarm is triggered on your property, you need a security team that will respond as soon as possible. With alarm response security from Signal 88 of Greater Philadelphia PA, you can rest easy knowing that help is on the way. 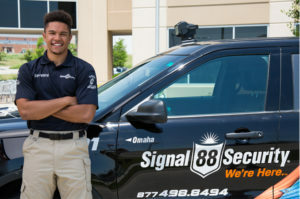 At Signal 88 of Greater Philadelphia, we’re known for our custom security solutions, delivering more effective and efficient security services to properties in the greater Philadelphia area. These solutions include our response services, which are provided by mobile security patrols. Thanks to our highly skilled team of security personnel and our innovative 88Edge® suite of security technologies, we promise a rapid, professional response to any alarms at your site. At Signal 88 of Greater Philadelphia, we deliver peace of mind. As greater Philadelphia’s source for mobile patrol security services, we’re committed to providing our clients with rapid response to any security event, including onsite alarms. Our 88Edge® suite of security technologies includes cutting-edge monitoring and dispatch systems for security alarm response. As soon as an alarm is activated on your property in Philadelphia, we log the event, alert response personnel, and direct further monitoring resources to the status of your site. Physical response is provided by mobile security personnel. Our GPS mapping technologies, mobile patrol routes, and personnel distribution ensures rapid arrival of personnel as soon as an alarm has been triggered. Our personnel respond in highly visible security vehicles, projecting a secure and professional presence, and we provide up-to-the-minute reporting while on site. 88Edge® reporting technologies allow you to receive report updates as they happen, meaning you can monitor the situation minute-by-minute from a remote location. Alarm response security from Signal 88 of Greater Philadelphia is available for all kinds of properties in the greater Philadelphia area. We offer alarm monitoring and dispatch services — as well as further security services — for residential sites, commercial buildings, and industrial properties. Our security solutions are available throughout Philadelphia proper, as well as in surrounding communities and neighbors. Our complete alarm response service area includes Bensalem, King of Prussia, Fort Washington, Norristown, and other nearby areas. Call Signal 88 of Greater Philadelphia today at (610) 489-1890 for more information on our alarm response services in the Philadelphia PA area and request a security consultation.